If you don't like Blogger's Dynamic Views, but your favorite blog enabled one of them, there's a way to go back to the previous template: just add &v=0 to the URL. 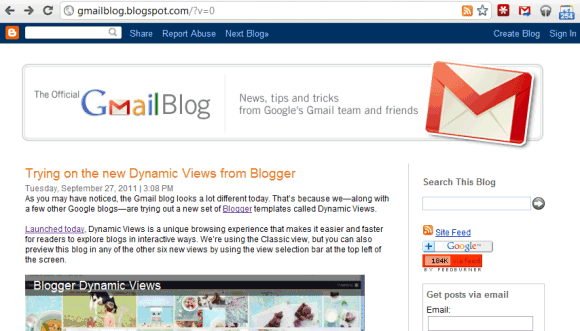 For example, here's the URL for Gmail's blog: http://gmailblog.blogspot.com/?v=0. Unfortunately, the change is not persistent and you need to add the parameter every time you visit the homepage or one of the posts. You can also bookmark the URL. I wish someone makes a browser extension that disables it automatically on all Blogger blogs. Is there a way to stop people from seeing you old site/layout. It's not so hard to create a Greasemonkey script that redirects all *.blogspot.com/* URLs to *.blogspot.com/*?v=0. @Sushubh that what i said a long time ago... maybe Google need to buy WordPress... simple, problem solved.. they had all the money, isn't they ? The string ?v=0 works for me only for the "Home" page of the blog. Who knows, what to do? OMG. how could i change it back!! Hi... There is no potion to disable this dynamic views? I want to get rid of them. Dynamic View have many error in webmaster google..